"Booth shipped to the East, by Monday’s express train, a car-load of salmon and vegetables. The car in which the shipment was made was one of those recently altered and provided with patent platforms, buffers, etc., and pointed so as to conform in color to the appearance of the passenger cars." Both the type of car and the color scheme raises questions in my mind. I assume that the cars from San Jose were switched into an eastbound Overland train at Niles. Any insights would be appreciated. Well, the timing is about right for Miller hook couplers to be applied, so this may represent some of the first "passenger fruit cars" (or it might just be a baggage car, although it sounds otherwise). The 1875 CP roster doesn't specifically call out any passenger fruit car, but I note all the fruit cars are listed between the baggage & express cars and the cabooses, with other freight cars listed after the cabooses. 28-foot fruit cars numbered between 3000 and 3028. The 1878 CP roster lists the same number series as above for fruit cars, all with the added notations as having "Miller Platforms and Air Brake connections". From this I surmise they may have had pass-through pipes for air, not brake cylinders. This time the fruit cars are in the midst of the freight car listings. The 1888 [also 1884] Carbuilder's Dictionary includes a drawing of a Central Pacific Fruit car with miller couplers (and associated platforms). It is described as having end ventaltors and double doors. It is probably one of the cars described. The drawings show the car lettered "Central Pacific" (in an ark) (new line) "0000" (new line) "Fruit Car." All lettering to the left of the door. If the scale is correct the lettering is at least a foot tall. I assume the matching paint would be a buttercup yellow instead of the mud yellow (as used on the CP built box at NSRM) or mineral red. I don't have specific information for 1873, but by mid 1870 there is a San Jose connection that meets the Atlantic and Pacific (and the Pacific and Atlatic) express originally at a point called "San Jose Junction" in the canyon, then later at Niles when the new bridge is built. And keep in mind the 1888 Car Builder's is itself a reprint of the 1884 Car Builder's, so the drawings predate that. Also the National Car Builder published a similar, but even more complete, set of drawings of the CP fruit car in June 1884. Russ clover of Clover House offers dry transfers of these, based on info I supplied him form the National Car Builder, which shows lettering on both sides of the door (not duplicative). In Sept 1870 the National Car Builder had an item about the CP shops building refrigerator cars. A July 20, 1883 item in the Railroad Gazette also mentioned the CP building refrigerator cars in Sacramento, but I suspect this may actually be the fruit cars, although to the contrary, the Nov 1885 Official Equipment Register lists both CP reefers and CP fruit cars. In a Harlan & Hollingsworth catalog from about 1876-7 (it includes a view of DO Mills' private car with hand written inscription that it was sold to A. A. Cohen, then a partner in the car with Mills and possibly others) there is a photo of a Central Pacific refrigerator car with Miller platforms and passenger trucks. Numbered CPRR 100, it does not seem to show up in the 1875 or 1878 CP rosters. Lettered on the side is "Patented 1872". It appears to have ice bunks accessed from openings high up centered on the ends. The often published photo of a CP fruit car with passenger trucks and Janney couplers is a car built around 1885-90, but upgraded - the photo is around 1901 or later. The CP got rid of the Miller platforms when they switched form Miller couplers to Janney couplers for passenger service. Note also the fresh paint panel for the Sunset herald, with the older Egyptian style lettering on the rest of the car. On a clear print, the post 1891 car number is CP 36903, while the earlier (pre-1891) number shows through as 5458. October 17, 1883 The Silver State (Winnemucca) - "For many years all of the passenger coaches, express, mail and sleeping cars of the Central Pacific Railroad have been a straw or yellowish color, unpleasant to travelers from the East, who are used to dark rich colors. The Sacramento Bee says the company has decided to repaint the cars and make them the rich dark color of Pullman sleeping cars of the present day, which is something darker than olive. This change is partly due to the fact that the Pullman Company will run sleepers on the Central Pacific route at will, and a uniform color is highly desirable in a train of cars. The change will be made as rapidly as posssible. ... There are, perhaps, 150 freight train cabooses to be painted a bright red color in place of the yellow, so that they can be seen at a greater distance." December 6, 1883 The Silver State - reported that CP Palace cars now being repainted orthodox Pullman colors and that the coaches will be painted like the Pullman cars. Thank you. I was not aware of the time or the scale of this transition. Subject: refrigating car A Booth Patent. The CP Sacramento shops built a number of the booth fruit cars and a number of the referigating cars both of which appeared to be a success. A Refrigerating Car:- Was recently constructed at the Central Pacific shops in this city for A. Booth & Co. of Chicago, which appears to be a complete success. It is lined inside and out, like the fruit cars of his design, and has in either end iron boxes as receptacles for ice, large enough to hold a quantity sufficient to last during a trip to the East. The best feature, how ever, consists of revolving fans in the roof, which are kept in motion by the momentum of the train, and serve to keep the air inside the car continually stirred up, and mixed with fresh air from the outside, thus causing it to avoid the dampness which might otherwise arise from the ice. Yesterday afternoon experiments were made with it, the ice boxes being filled and arrangements made the same as if it was about to start for Chicago. It was then taken out by a locomotive a short distance on the Central Pacific Railroad, and worked admirably. The temperature of the car was low, but the air dry. A handkerchief which had been dipped in water on leaving the city and hung up in the car was found to be dry on reaching the American River Bridge. July 2, 1883 Reno Evening Gazette – sleepers turned over to Pullman Company today. August 13, 1883 Reno Evening Gazette – rebuilt Pullman sleepers, formerly SP and CP, still yellow-colored. October 20, 1883 Reno Evening Gazette – cars to be painted dark olive color, like Pullman cars (similar to the report in the October 17, 1883 Silver State that I previously posted). Then there is this item dated October 17, 1883 (I don't still have the name of the newspaper; it may have been the Reno Evening Gazette) – Central Pacific cabooses to be painted bright metallic red color, from yellow, to make them more visible. That "bright metallic red" for the cabooses shows up in a couple of newspapers. I have it from the Truckee Republican. I just can't make metallic (iron oxide) red very bright! Maybe with enough varnish . . Wendell. Varnish wouldn't do it...that would just make it yellower/warmer and darker at the same time. To be "bright metallic red" it would have to start out that way. Just the term metallic suggests it was not a vermilion or "fire engine red" but a strong mineral red. Union Pacific's more contemporary (say, circa 1950-60) freight car oxide red jumps to mind, at least two shades lighter and brighter than Espee's freight car red of the same period. If we assume that Metallic red means Iron oxide based, then Indian red (as in India, not from a native American source) produces a red that is nearing what we call red as apposed to a red-brown. The paint research we did for SPC 472 suggested that by 1899 SP's (and CP's) standard metallic was a very brown color. If this was the same color that CP has used earlier for box cars, and that this was the metallic they were used to, a very red mineral based iron oxide paint would very different, and look bright at least by comparison. Does anyone know what color Central Pacific & Southern Pacific boxcars were painted in the 1880's, 1890's & 1900's? I've always assumed they were some shade of "boxcar red," but I've recently seen photos of scale models from a reputable source showing them to be an unattractive gray (apparently like the color of the depots discussed in a earlier post on this site). On the other hand, cars of narrow gauge subsidiary South Pacific Coast always show up as boxcar red. If the gray is correct, I wonder when it changed & what color it changed to? On other sites, I've seen references to cars being chocolate brown at some time in the past (date not given) before being changed to boxcar red. An 1896 description of freight car paint includes a lot of clay in addition to other pigments – a very brown resulting color. I generally believe they started painting freight cars metallic in the early 1880's – perhaps earlier. By 1909 freight cars and caboose bodies are painted CS 11 Metallic paint – an iron oxide based red-brown. Exception is sides of refrigerator cars painted CS 8 Yellow (but ends are metallic). Lettering is white. Metal surfaces and parts are painted CS 13 Carbon black – including trucks. 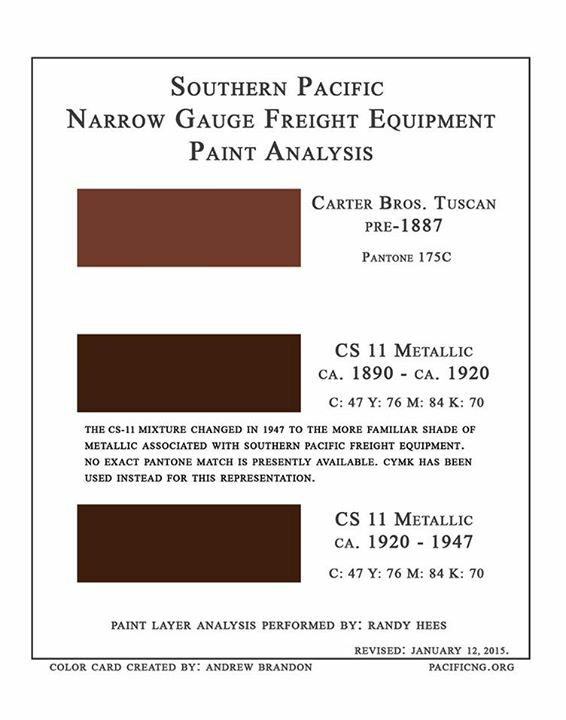 We posted a draft color card for SPC/SPng freight car paint on the Pacificng facebook page.